Without Hitler's halt order, the beaches of Dunkirk would have become a giant POW cage. War movies tend to depict the battles a nation wins—not the ones it loses. So with a blockbuster Hollywood movie on Dunkirk hitting the silver screen this July, one would think that Dunkirk was a British victory. In fact, Dunkirk was the climactic moment of one of the greatest military disasters in history. From May 26 to June 4, 1940, an army of more than three hundred thousand British soldiers was chased off the mainland of Europe, reduced to an exhausted mob clinging to a flotilla of rescue boats while leaving almost all of their weapons and equipment behind. The British Army was crippled for months. If the Royal Navy and Royal Air Force had failed, and the Germans had managed to conduct their own D-Day invasion of Britain, the outcome would have been certain. So why do the British celebrate Dunkirk as a victory? Why is it called the Miracle of Dunkirk when another such miracle would have given Hitler the keys to London? Consider the situation. In just six weeks during the spring of 1940, Britain and France had been crushed. When Hitler invaded France and the Benelux countries on May 10, 1940, the Allies were totally off balance. The cream of the Franco-British armies, including much of the ten-division-strong British Expeditionary Force (BEF), had been stationed in northern France. The plan was for them to advance into northern Belgium to stop a German advance, because that was the route the Germans took in 1914. Unfortunately, the German panzer spearhead divisions struck in the center of France, through the weakly defended Belgian and Luxembourg Ardennes forest. 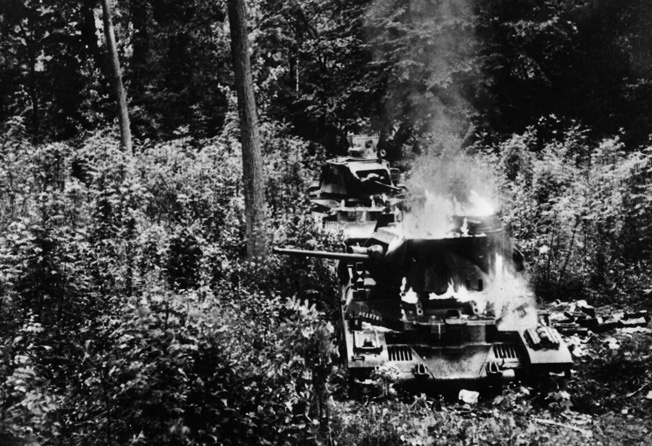 Quickly penetrating through the wooded hills, their tank columns turned north to cut off the Allied forces in Belgium from behind, while other German forces—backed by paratroopers—seized Holland and squeezed the Allies from the other direction. Plagued by disorganization and lethargic leadership, the Allies tried to retreat from Belgium back to France. But it was too late. On May 19, the hard-driving panzer divisions had reached Abbeville, on the English Channel. The bulk of the Allied armies were trapped in a pocket along the French and Belgian coasts, with the Germans on three sides and the English Channel behind. Meanwhile, other German column raced for Paris and beyond, rendering any major French counterattack nothing more than a mapboard fantasy. A British Matilda II tank burns during the Battle of France. The British did what they always when their armies overseas get in trouble: start seeking the nearest port for an exit. With a typical (and in this case justified) lack of faith in their allies, they began planning to evacuate the BEF from the Channel ports. Though the French would partly blame their defeat on British treachery, the British were right. With the French armies outmaneuvered and disintegrating, France was doomed. But so was the BEF—or so it looked. As the exhausted troops trudged to the coast, through roads choked with refugees and strafed by the Luftwaffe, the question was: could they reach the beaches and safety before the panzers did? There were four hundred thousand British and French troops to evacuate, through a moderate-sized port whose docks were being destroyed by bombs and shells. Even under the best of conditions, it would have taken more time than the Allies could rightfully expect for those troops to be lifted off the beaches. Despite the general Allied collapse, the British and French troops defending the Dunkirk perimeter fought hard under constant air attack. Nonetheless, had Hitler’s tank generals such as Heinz Guderian had their way, the hard-driving panzers would have sliced like scalpels straight to Dunkirk. The beaches would have become a giant POW cage. Then on May 24, Hitler and his high command hit the stop button. The panzer columns were halted in their tracks; the plan now was for the Luftwaffe to pulverize the defenders until the slower-moving German infantry divisions caught up to finish the job. Why did Hitler issue the halt order? No one knows for sure. Hitler had fought in that part of France in World War I, and he worried that the terrain was too muddy for tanks. Luftwaffe commander Hermann Goering assured him that his bombers and fighters could do the job. There were concerns about logistics, or a potential French counterattack. Or maybe it was just that Hitler, that perennial gambler, was so dazzled by his own unexpected success at the dice table of war that he lost his nerve. Whatever the reason, while the Germans dithered, the British moved with a speed that Britain would rarely display again for the rest of the war. Not just the Royal Navy was mobilized. From British ports sailed yachts, fishing boats, lifeboats and rowboats. Like the “ragtag fleet” in Battlestar Galactica, anything that could sail was pressed into service. France has been ridiculed so often for its performance in 1940 that we forget how the stubbornness and bravery of the French rearguards around Dunkirk perimeter allowed the evacuation to succeed. Under air and artillery fire, the motley fleet evacuated 338,226 soldiers. As for Britain betraying its allies, 139,997 of those men were French soldiers, along with Belgians and Poles. 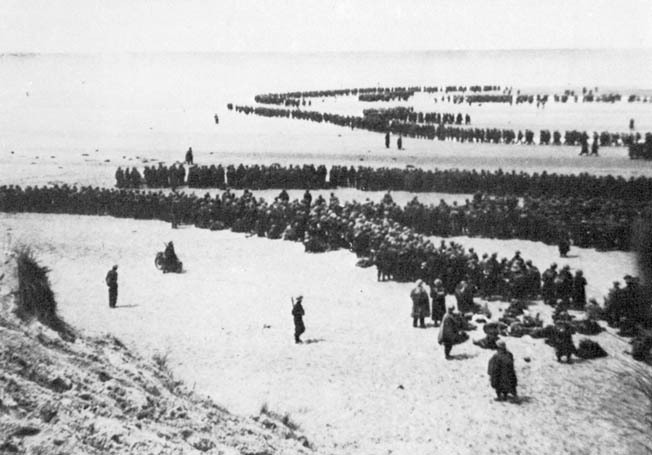 Dunkirk, late May 1940: British and French troops await evacuation to Britain. As they heaved themselves into the boats under a hail of bombs, the soldiers cursed the RAF for leaving them in the lurch. They couldn’t see above the tumult above the clouds where the RAF Hurricanes and Spitfires hurled themselves against the Luftwaffe. Weakened by losses during the French campaign, the RAF couldn’t stop the German air assault. But they at least could hamper it. The evacuation was incomplete. Some forty thousand troops were captured by the Germans. The Scotsmen of the Fifty-First Highland Division, trapped deep inside France, were encircled and captured by the Seventh Panzer Division commanded by Erwin Rommel. The BEF did save most of its men, but almost all its equipment—from tanks and trucks to rifles—was left behind. So why did the British treat Dunkirk as a victory? Partially it was out of necessity. The British public needed some good news now that their world had fallen apart. Yet despite Churchill’s rousing rhetoric about the battle, he knew that pseudo-victories would never defeat Hitler. “Wars are not won by evacuations,” he told the House of Commons. The best answer is that the successful evacuation of the cream of the British Army gave Britain a lifeline to continue the war. In June 1940, neither America nor the Soviets were at war with the Axis. With France gone, Britain, and its Commonwealth partners such as Australia and Canada, stood alone. Had Britain capitulated to Hitler, or signed a compromise peace that left the Nazis in control of Europe, many Americans would have been dismayed—but not surprised. Their patience and endurance were rewarded on May 8, 1945, when Nazi Germany surrendered. Tags Allies, Axis, British, British Expeditionary Force, Dunkirk, English Channel, Erwin Rommel, France, luftwaffe, Luxembourg, Nazi Germany, Royal Air Force, SAS.